Primary Target: Primarily boys aged 4-9 years. Secondary Target: Kids aged 4-15 years. These are the official Mangle licensed characters, Mangle. Robozuna follows the story of Ariston, a 14-year-old boy and Mangle, his robot best friend. When their home colony is destroyed by the Corvus Imperium Ariston and Mangle are forced to go in search of sanctuary, finding it with Team Veredus – a Robozuna team with a secret agenda. Robozuna is the ultimate bot-battling competition, a fun and thrilling futuristic sport played by robots. The pair enter the toughest competition in the universe with a plan to free their country from an evil empire and its legion of robots. Mangle isn’t your average Combatabot. Most are fitted with a cool looking weapon, whereas Mangle has two powerful hands, and something unique, the ability to learn! Join Ariston and Mangle on a thrilling journey as they discover that heroes are not only born, they’re built! Season 1 premiered on CITV & Netflix in October 2018, closely followed by Season 2 in March 2019. 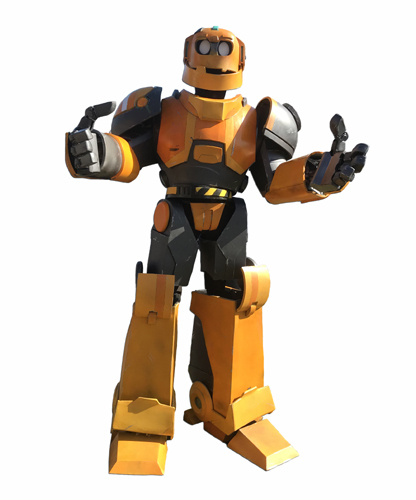 Taylor Clarke-Hill (Ariston) and Tom Clarke-Hill (Mangle) provide the voices of Robozuna‘s two main characters. The series also features voice acting talent from Hannah Arterton (Safe, The Five) and Michael Obiora (Tomb Raider, Luther). Mascot costume Mangle from Robozuna is available to attend UK events.